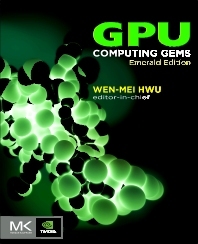 GPU Computing Gems Emerald Edition offers practical techniques in parallel computing using graphics processing units (GPUs) to enhance scientific research. The first volume in Morgan Kaufmann's Applications of GPU Computing Series, this book offers the latest insights and research in computer vision, electronic design automation, and emerging data-intensive applications. It also covers life sciences, medical imaging, ray tracing and rendering, scientific simulation, signal and audio processing, statistical modeling, video and image processing. This book is intended to help those who are facing the challenge of programming systems to effectively use GPUs to achieve efficiency and performance goals. It offers developers a window into diverse application areas, and the opportunity to gain insights from others' algorithm work that they may apply to their own projects. Readers will learn from the leading researchers in parallel programming, who have gathered their solutions and experience in one volume under the guidance of expert area editors. Each chapter is written to be accessible to researchers from other domains, allowing knowledge to cross-pollinate across the GPU spectrum. Many examples leverage NVIDIA's CUDA parallel computing architecture, the most widely-adopted massively parallel programming solution. The insights and ideas as well as practical hands-on skills in the book can be immediately put to use. Computer programmers, software engineers, hardware engineers, and computer science students will find this volume a helpful resource. For useful source codes discussed throughout the book, the editors invite readers to the following website: <a href="http://gpugems.hwu-server2.crhc.illinois.edu</a>…"